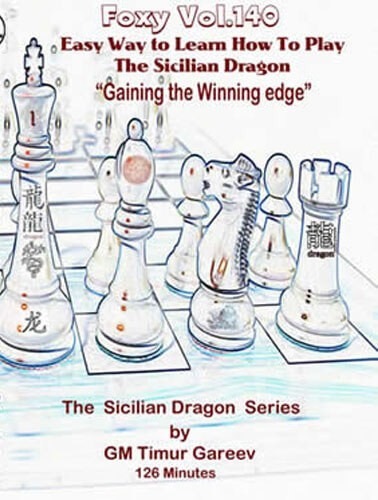 GM Timur Gareev (Currently Ranked in the top 100 Players in the World) presents on this DVD the thematical ideas and motives in The Sicilian Dragon. GM Gareev covers the key ideas and tactical routes for Black to gain a counter-attacking edge. Also Modern Examples-Mastering the sharpest theoretical variations and understanding White's attacking motives. Material is made easy to understand and learn by avoiding long complicated lines. This Dvd Dragon Series covers lines for both White and Black. The DVD starts with introduction and continues on to the first step of classic examples by Simagin. Phase two covers understanding white's attacking motives: Karpov-Kortchnoi. And phase three covers engaging in theoretical battles: Modern Elite Chess examples. This DVD serves to introduce the player to the thematical ideas and motives in Dragon variation. GM Timur discusses the key ideas and tactical routes for black to gain the counter-attacking edge.